"New England’s Best Party Artists"
Make your event more enjoyable. Add artistic entertainment to your gathering by hiring caricature artists and face painters from Boston Caricature in Massachusetts. Our party artists are available for various kinds and sizes of events. We will help you put together entertainment that is unique without going over budget. Do you want to give out cool keepsakes to your guests that will remind them of your amazing event? A comical hand-drawn portrait will surely be a nice token that will make your gathering worth remembering. Our talented artists will bring more life and entertainment to your event. 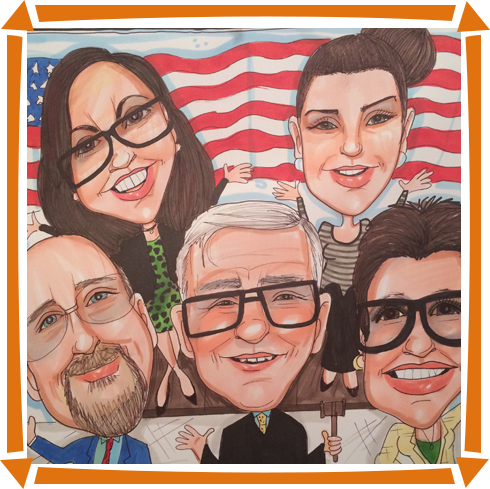 Let our artists draw caricatures of people at your event. Contact Boston Caricature today to inquire about our services or book our artists for your gathering. Our face painters, tattoo artists, and caricaturists are more than happy to share their skills and put a smile on your guests’ faces.